It’s been a full day since Charles Oakley got tossed out of Madison Square Garden and arrested following a fight with MSG staffers. Tonight, the building was back in use for an NHL game. The New York Rangers hosted and beat the Nashville Predators, 4-3, but the Knicks’ contentious handling of Oakley was still the subject du jour. 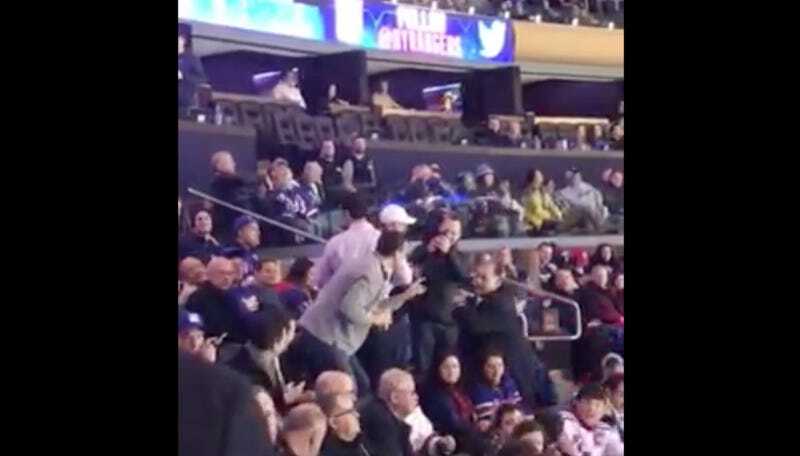 New York sports fans were clearly not done ridiculing James Dolan for his thin skin, and the hero in the video below tried to start numerous pro-Oakley chants throughout the game. Security apparently tried to intervene, but as Deadspin reader Corey tells us, they backed off once fans started voicing their disapproval and filming the interaction. Our man got off a celebratory “FREE-EE OAK-LEY!” chant as they scurried away. It started in the 2nd period and the guy started a “Char-Les Oak-Ley!” chant. Then in the in 3rd, the same guy started a “Fr-ee Oak-ley!” chant. Security just comes up to him and tells him he’s gone. The guy says I was just chanting and did nothing wrong. That back and forth is what you’re seeing in the video. It was completely unprovoked and the guy did nothing wrong. Security started to gather at both ends of the section, but once they saw cameras out and people saying that he did nothing wrong, they left. God bless New York sports fans for refusing to let this one go sitting down.